Question: What are Chocolate & Zucchini and Gastropoda? Answer: Food blogs, of course, as many food-blog enthusiasts will recognize! 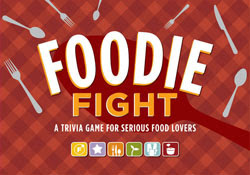 The game comes with 168 trivia cards (each with questions in six food-fun categories) plus game boards (for individuals or teams) and playing tokens. Use the boards and tokens or just fly through the question cards. The questions are a perfect mix of the obscure (Q. How many bubbles in a bottle of champagne, anyone?) and the familiar (Q. What vegetable is some times referred to as "Swiss", after a 16th-century botanist?) -- so you'll be stumped often enough to learn something but not so often as to feel stupid. And when you know the answers -- and you will, I promise -- you'll feel like a culinary brainiac. Such fun -- for dinner parties, diversions during long car trips, conversation starters to kick-off meetings, even ice-breakers when strangers make long bus rides, a kick-off to food-related meetings? FULL DISCLOSURE I met Joyce Lord, Foodie Fight 's developer, last week but honestly, had already fallen head-over-heels in laughter for it before knowing she was the mastermind behind the game and she'd given me a complimentary box. I'm making my holiday gift list right now -- what a fun idea. I guess food blogs really have arrived! I must have it now. Yes, a REALLY great gift idea. I want it too! LOL! How many bubbles in a bottle of champagne? I'd venture a guess, but I'm still trying to figure out how many beans are in that proverbial jar in the carnival tent! Thanks for the heads's up, Alanna. Gotta get this! I love this game! The very idea of it is perfect for people who follow the food scene and the questions are really good too. Some stumpers, some easy ones, most make you think. Kudos to Joyce for coming up with this idea and seeing it through to reality. LOVE the game, got it for my food loving boyfriend for Christmas. The downside... we have already played it so many times, we are repeating questions. If you hear of any add-on's to the game, such as more game cards, please post here. Thanks and enjoy! I am going to have to give this game a try. Great review!